A few weeks ago I already wrote about my efforts to find a way to preserve rhubarb without pickling it with loads of sugar or making jam. Instead of using sugar as a preservative, I experimented with lacto-fermentation and let a jar of rhubarb sit for two weeks in a slightly salty brine. I guess you could also use whey to help the fermentation process along. Initially I expected it to be way too sour and thought about adding a little rice malt syrup, but let me tell you: you absolutely won’t need any sweetener! The rhubarb looses most of its sharpness without becoming bland. It turns into a delicious pickle that you can add to salads like the one below, to nourish bowls or eat straight from the jar. It’s also especially great as a sandwich topping. Give it a try on creamy goat’s cheese – so good! In case you are new to fermentation: In a nutshell, it’s a technique that not only helps to preserve food and adds flavour, but has many, many health benefits. It is definitely worth the effort, since at least in Germany it is almost impossible to find truly lacto-fermented vegetables in stores. Even in organic grocery stores pickles, such as gherkins, or sauerkraut are being pasteurized – and therefore devoid of any beneficial bacteria – and pickled in vinegar and often sugar instead. Wild-Fermentation on the other hand means that the sugars and starches present in vegetables and fruit are converted into lactic acid by bacteria called lacto bacilli (hence ‘lacto-fermentation’). You don’t need to add any culture or starter, the bacteria and enzymes that are necessary for that transformation process are in and on the surface of fresh veggies and fruit. The main benefit of fermented food is that it enhances the nutrients present in the food and makes them more readily available. Fermented foods are packed with enzymes and probiotics, which help maintaining a healthy gut flora and ease digestion, especially of protein. Which is why many cultures eat fermented foods, such as sauerkraut, kimchi or yoghurt along rather heavy meat dishes. Fermentation turns humble and cheap veggies like cabbage almost effortlessly into real superfoods – how cool is that? To prevent spoilage, you should start by sterilizing the jar. I simply fill the jar with boiling water and let it it sit for 10 minutes but you can also place it on a tray and put in the oven for 10 minutes on 180°C. Meanwhile wash the rhubarb and cut it into 2 cm pieces. Slice the onion horizontally. To make the brine mix 400ml water with 1 tbsp salt. Place rhubarb, onion and spices in the jar and cover with the brine. Sprinkle with the remaining 1/2 tbsp of salt and make sure everything is covered with liquid. This is very important – I used a little saucer to way down the rhubarb, but you can also buy weights that are especially designed for that purpose. If necessary add more water, but make sure to leave about 2cm space underneath the top of the jar, because the veggies and their juices will expand during fermentation. Close the jar with an airtight lid and let it sit at room temperature. Now all you have to do is wait for approximately two weeks. After that time the pickles can be stored in the fridge. 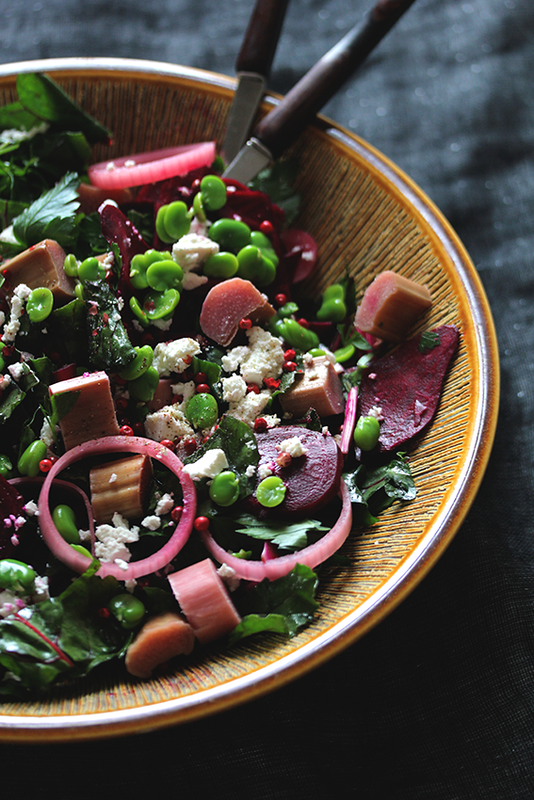 This salad celebrates the early summer season and really is the result of some kind of brainwave that hit me when I saw those beautiful beets on the market. Usually I’m not the biggest beets fan around, because I tend to find their sweetness too bland especially when they are cooked. I like them best in combination with strong flavours such as lots of apple cider vinegar and roasted walnuts. No wonder my jar with fermented rhubarb and onion sprung to my mind. Feta or soft goat’s cheese is obviously another component that rounds the tangyness of the rhubarb and adds a kick to the sweetness of the beets and the tender beans. Fresh beets can’t be compared with their canned or vacuum packed counterparts. And yes, you can definitely eat them raw along with their greens! Like other dark leafy greens such as kale, spinach and chard they are packed with vitamin A and K (remember that those are fat soluble vitamins – so don’t use that olive oil too sparingly). When I eat them raw, I like to massage them a little with oil to help to break down their cellulose structure and aid digestion. But beet greens are also great in a quick sauté, as an addition to frittatas or quiches. Peel the beets and slice them as thin as possible using a mandoline or a food processor. Wash the greens and slice the stalks into 1 cm pieces. Marinate the beetroot slices and the stalks in about 100ml of the liquid from your jar with the fermented rhubarb. 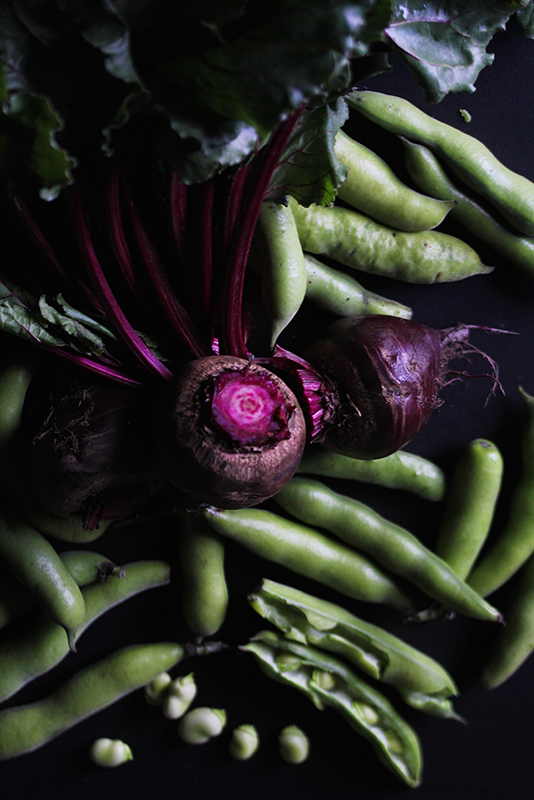 In the meantime remove the broad beans from their pod and blanch them for about 2 minutes in boiling water. Drain them, then place them in a bowl with cold water and gently squeeze the bright coloured tender beans out of their skin. Chop the beet leaves, drizzle them with 1 tbsp of live oil and gently massage them like you would with kale. Chop the parsley. Add the beets with the stalks and about 5 tbsp of the fermented rhubarb along with a few of the onion slices. Make a dressing from the beets’ marinate, 1 tbsp olive oil, black pepper and maybe a little salt (keep in mind that the fermentation liquid, the rhubarb and the feta are salty as well). 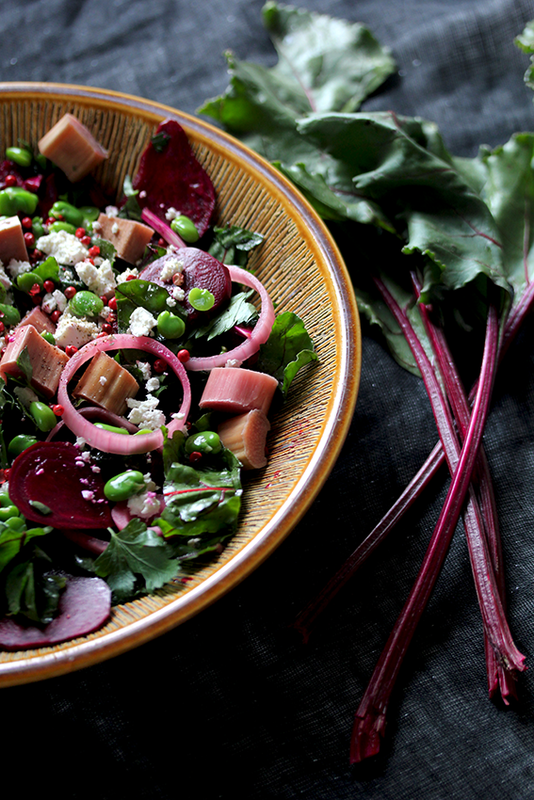 Mix everything in a large bowl an top with broad beans, crumbled feta and pink pepper berries.